Never give up your protein! Every protein is unique and has its own temper. Someone likes salt; someone likes low pH and even someone likes ethanol! You must know what condition your protein like or it will die. But it’s a long way to figure it out. When I started my first PhD project, it was the first time for me, and also for my partner Zhaofeng, to handle the outer membrane protein in the type II secretion system (T2SS). GspD from Vibrio cholerae and enterotoxigenic Escherichia coli (ETEC), outer membrane channels, showed extremely low expression level in the normal purification procedure. If you were careless, you may think there isn’t a protein peak in the gel filtration result and may take it as an AKTA system fluctuation! Benefitting from the single particle cryoEM technique, we could resolve its structure only using a small amount of GspD protein. Even that, we still needed to use the holey carbon grids with homemade continuous thin carbon film to enrich protein particles and improve the protein orientations. Luckily, we didn’t give up our protein so that we can enjoy the beautiful secretin structure. Next, we aimed to explore how secretin GspD can be located in the outer membrane with the help of its pilotin AspS. We wanted to get the AspS-GspD complex by in vitro recombination using AspS as a bait to pulldown the GspD. However, it didn’t work. After many attempts, we changed the strategy and cloned these two genes into the same vector together by ligation independent cloning (LIC) method. At this time, the co-expression of ETEC AspS-GspD complex worked! Cryo-EM images showed that some of the complex tended to be aggregation after concentration, which made the useful particles fewer. Benefit from the C15 symmetry of complex, eventually, we got the pilotin-secretin structure at near-atomic resolution. Compared with the GspD alone, the complex structure told us why we failed to get the complex by in vitro recombination (details see the paper). We found that there are the predominated hydrophobic interactions between the pilotin and the secretin C-terminal helix (α12), which are common among the known instances of the secretin–pilotin complex, like MxiM–MxiD in T3SS and OutS–OutD in Klebsiella-type T2SS. One single mutation (F639A) nearly abolished the assembly of AspS and GspD. 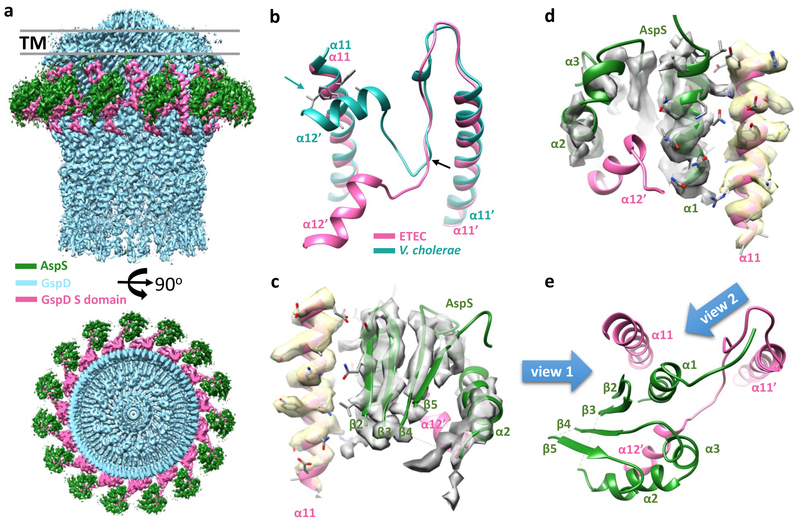 Benefiting from the full-length structure, we also saw the existence of some weaker interactions beyond the pilotin-α12 interaction. These interactions provided a new binding mode between the pilotin and the secretin. It’s a hard work but pretty story I think. It may be a reward for our team to explore the scientific world because we didn’t give up when we encountered a seemingly insurmountable obstacle. But in the end, it still need to explain more details for the assembly and translocation mechanism of T2SS. Written by Meng Yin on behalf of the co-authors.